In 1820, Washington Irving published his short story “The Legend of Sleepy Hollow,” and thereby set loose one of the best known American monsters. The story is set around 1790 in the village of Sleepy Hollow, New York, where a teacher named Ichabod Crane and a town bully named Abraham “Brom Bones” Van Brunt have a rivalry regarding the daughter of a wealthy farmer. One night after leaving a party at the farmer’s house where tales of local ghosts and spooks were being told, Crane finds himself being pursued by one of the very specters that was discussed: a Headless Horseman! 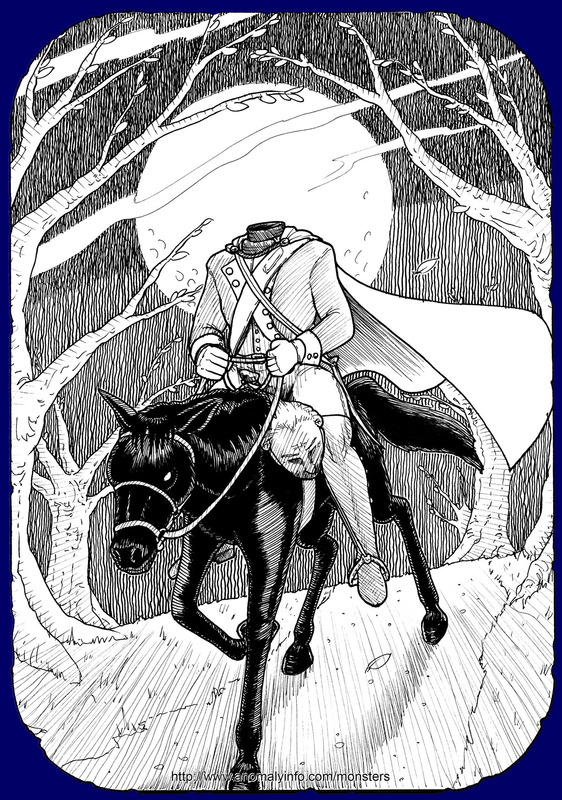 Said to be the ghost of a Hessian [German] trooper who lost his head to a cannonball during the American Revolutionary War, the Headless Horseman supposedly rode out each night with his head on the pommel of his saddle. A wild chase ensued as Crane tried desperately to avoid the headless specter, and the Headless Horseman followed Crane’s horse all the way. Crane rode like a madman, making for a bridge near a local church; he did this because of the two tales he had heard of the horseman earlier in the evening. The first eerie tale was told of old Brouwer, a disbeliever in ghosts, who met the Headless Horseman while out walking one night. Obliged against his will to get upon the specter’s horse, they galloped away madly until they reached the bridge. At this, the horseman suddenly turned into a skeleton, and sprang away over the tree-tops, leaving Brouwer behind. The second tale was told by Crane’s rival, Brom Bones, of his own encounter with the ghost. Bones stated that one night he and his horse had been overtaken by this midnight trooper, and that Bones had offered to race the specter. He would have won the race, Bones claimed, but as the two riders came to the church bridge, the Headless Horseman bolted and vanished in a flash of fire. Due to these testimonies, Crane was sure that if he could cross that bridge, he would be safe. As Crane galloped across the bridge, he looked back to see if the Headless Horseman had vanished... but the ghost had not. Instead of disappearing, as Crane hoped, the monstrous being threw its separated head at the schoolmaster, hitting him directly in the noggin and knocking him from his horse. What happened to Crane after that? The author doesn’t tell us... just that Crane’s horse was found outside the schoolhouse he lived in, and that signs of the ride were found near the church, along with Crane’s hat beside a shattered pumpkin. The residents of Sleepy Hollow quickly came to the conclusion that Crane was carried away by the ghostly Headless Horseman. Except... it was also told that in later years an old farmer, who had traveled abroad, reported Crane was alive and well, living in a different part of the country now; and Brom Bones, who married the farmer’s daughter after Crane’s disappearance, always smiled knowingly when the spooky tale of Crane's moonlight chase was told, and he always laughed at the mention of the pumpkin each time. "The Legend of Sleepy Hollow" is believed to be purely fictional, Irving’s own creation, though the lead characters are noted to resemble people he did know; but the image of a headless horseman, and the idea of being pursued by such a ghost, have many parallels throughout the world. On an interesting side note: the Headless Horseman of "The Legend of Sleepy Hollow" was one of the first monsters to be featured in movies, appearing in a silent film released in 1922! Rip Van Winkle & The Legend of Sleepy Hollow, by Washington Irving, 1917 The Harvard Classics Shelf of Fiction. The short story "The Legend of Sleepy Hollow" is online: Click here! "The Headless Horseman (1922 film)," page in the Wikipedia website, viewed 4-15-2014. To read about the film: Click here! - or to watch the movie: Click here!